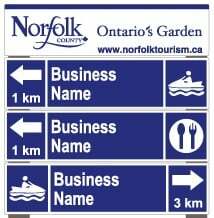 Norfolk County’s Tourism Directional Signage Policy outlines in detail the aspects of this program, who is eligible, and how to participate. See Norfolk County Policy DCS-05 for more details. 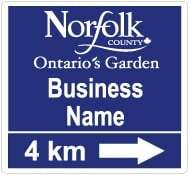 Contact Business Development Supervisor, Norfolk County, at 519-426-5870 ext 1300 or contact us. If you would like to install a directional sign on a provincial highway, please contact Canadian TODS Ltd. at www.canadatods.interstatelogos.com/state/home.aspx. Some former provincial highways (Hwy 59, Hwy 24 south of Simcoe, Hwy 6 west of Port Dover) have been downloaded to Norfolk County, and in those cases please contact the Norfolk County. For more information, contact the Business Development Coordinator, at (519) 426-5870 ext. 1300.